There are plenty of options when it comes to valve DI boxes, but this offering from Notiko takes a slightly different approach from most — a hybrid valve/solid-state design, it can be powered either from the included power supply or from a standard 48V phantom power source. 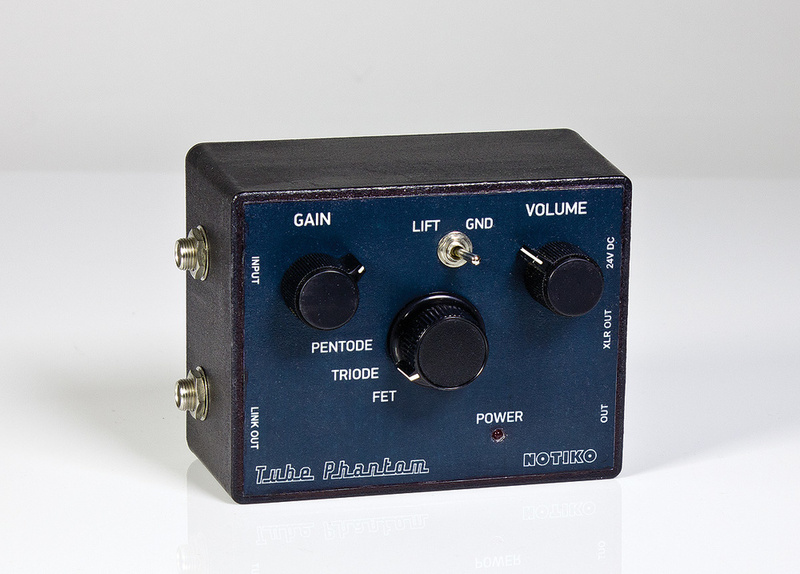 The largest of three knobs is a rotary switch, and this chooses between pentode, triode and FET operation. A small 6418 wire-ended valve is placed in circuit for the two valve settings, and the manual warns that the volume must be turned down when changing modes (because some switching noise is inevitable). The FET setting is designed to deliver a transparent solid-state tone, while the two valve settings include deliberate valve coloration. The designers suggest the triode mode for adding warmth, and the more obviously coloured pentode setting for enhancing punch. To make the amount of valve coloration adjustable, the Tube Phantom has separate controls for input gain and volume. When in triode and pentode modes, the gain pot works to change the drive to the tube circuit. The volume control simply adjusts the overall output level. 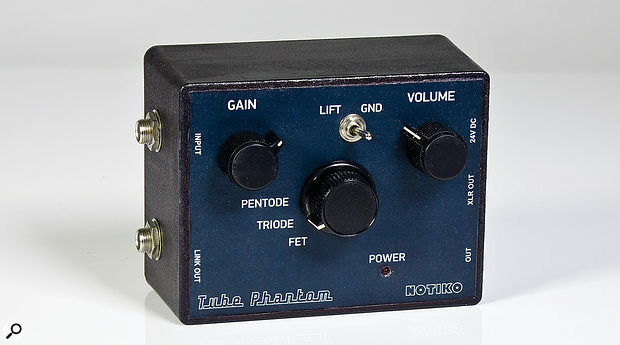 Unlike most DI boxes, the Tube Phantom, which is built into a die-cast box, can accommodate unbalanced inputs from around mic level up to line levels, and the manufacturer claims 10V of input headroom, which enables it to take inputs from instruments with powerful active pickups without clipping. At the other end of the scale, it can amplify lower-level signals such as passive magnetic or piezo pickups. The input impedance is 20MΩ, which allows the DI to work with high-impedance pickup systems, and we’re told the input is DC coupled from the input socket. The XLR output is also DC coupled to the input of the connected console or interface. Apparently, this choice of DC coupling was made to extend the frequency response and to remove the phase distortion that’s introduced by capacitive or inductive coupling. Hand-matched components are employed to improve the noise performance (quoted as 118dBu), and this has benefits even in situations where lighting dimmers are in use. The final control is a ground-lift switch (which should only be needed when the input source has its own mains ground). The input and associated link output are both via metal-bodied, unbalanced quarter-inch jacks, whereas the variable mic/line output level is delivered via both a balanced XLR and an unbalanced quarter-inch jack. The output impedance is a hair under 300Ω. Within the audio range, the frequency response in FET mode is flat to within 0.03dB where the -3dB points are at 0.1Hz and 600kHz. Even in tube mode the -3dB points are at 10Hz and 400kHz. Harmonic distortion is better than 0.08 percent — unless, of course, you deliberately dial in some valve coloration. A coaxial PSU socket couples to the included power supply for when phantom power is not available. On receiving the Tube Phantom DI I decided that before switching it on I’d take a look inside, just to see how everything was put together. It’s as well that I did, because one of the valve output wires had come free from its push-in socket! This perhaps isn’t surprising, given that all that protects the slim valve is a pair of grommets pushed over it; these aren’t attached to anything, meaning that the valve is free to ‘boing’ about on its wires. The socket doesn’t seem to grip the wires very tightly so I’d be very nervous about using one of these boxes live without taking extra steps to fix the valve in place — it could probably be secured perfectly well using a couple of cable ties. In all other respects, the construction is suitably workmanlike. All the components are mounted on a single circuit board, and the connectors are wired to the board rather than being mounted on it. Testing the Tube Phantom with a guitar and a bass, I first dialled up the FET mode, and the result was instantly more detailed and lively than when plugging directly into my audio interface, even though the latter claims to offer a ‘Hi-Z’ instrument input. There was no noticeable noise, so I switched to triode mode... and just as promised this added more warmth to the sound without introducing any noticeable distortion, even at the maximum gain setting. Pentode mode added even more girth to proceedings, again with no obvious distortion. Conscious that a good DI box or buffer can make a significant improvement when DI’ing a guitar into an audio interface (even one that boasts a high-impedance input) I then compared the FET mode with my own home-made buffer pedal. With both, the sound was much more lively and open than when plugging directly into my interface. Realistically there was very little in the way of subjective difference between the two boxes when the Notiko was used in FET mode, even though my buffer uses a transistor in a boot-strapped emitter-follower configuration rather than a FET. However, my buffer certainly couldn’t match the warmth of the Tube Phantom’s two valve settings, and attempts to match the pleasing effect of the Tube Phantom by adding more low end EQ didn’t quite yield the same results either — the difference was especially noticeable on bass guitar. I have to conclude that the Notiko Tube Phantom is an impressive piece of electronic design. It’s let down only by the lack of a secure fixing for the valve, and that’s a problem that’s easily addressed. Being able to run a valve DI box from phantom power is extremely convenient, and I have no adverse comments whatsoever regarding the sound quality. So if you like the idea of a tube DI, and the option of three slightly different ‘flavours’, the Notiko Tube Phantom ticks all the sonic boxes for guitar and bass use.